THREAD is back visiting San Francisco this weekend and I will of course be spending my birthday at the show in seek of some fabulous duds, while enjoying some much needed pampering! In honor of my THREADshow birthday bonanza, THREAD will be offering a Mimi's Muneca signature birthday cocktail, the Mimi Bellini, at the THREAD cocktail lounge. 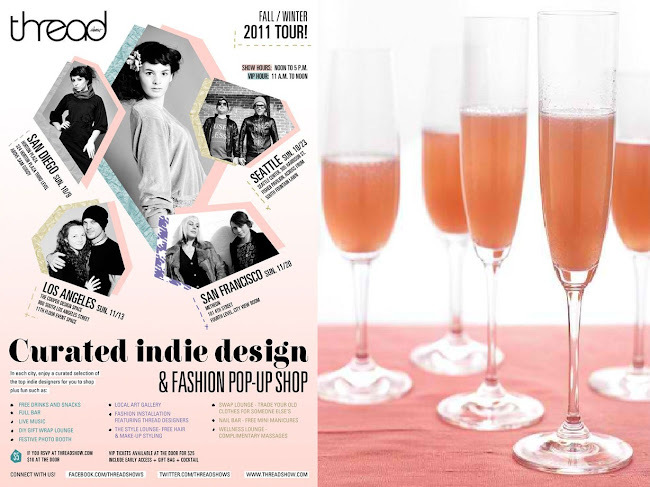 For a chance to win a signature cocktail on me, wear your most fab SF look to the show, for I will be awarding drink tickets to 7 lucky stylish thread goers in celebration of turning 27! Don't forget to "Like" the THREADshow Facebook Fan Page as well as the Mimi's Muneca's Facebook Fan Page to track my THREAD show fashion endeavors and fashionista finds. I will be posting live pictures throughout the day! Also stay tuned to get a special look at the THREAD show VIP hour.